Given the health benefits of Beetroot, I try to make this Curry at least once in a few days and we all like it too. Just that chopping beetroot is so messy that I am sometimes a little lazy to chop it and clean the mess! But recently, my cousin told me a neat idea to chop beetroot. She asked me to pressure cook the beetroot as is and upon cooling, it is easier to peel and chop it. I tried it and found it to be useful. So here is the humble Beetroot Curry.. Note - I also mix chopped carrot and it tastes equally divine. Coarse grind Peanuts, Coriander leaves and coconut. In a heated kadai/wok add oil, and the rest of the seasoning and after the mustard seeds crackle, add the chopped green chillies. Add the cooked beetroot, turmeric and ground peanut mixture. Mix in salt and sugar. 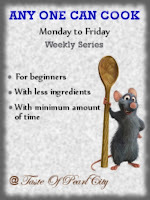 Sending this simple and nutritious curry to Umm Mymoonah's 'Anyone Can Cook' series. 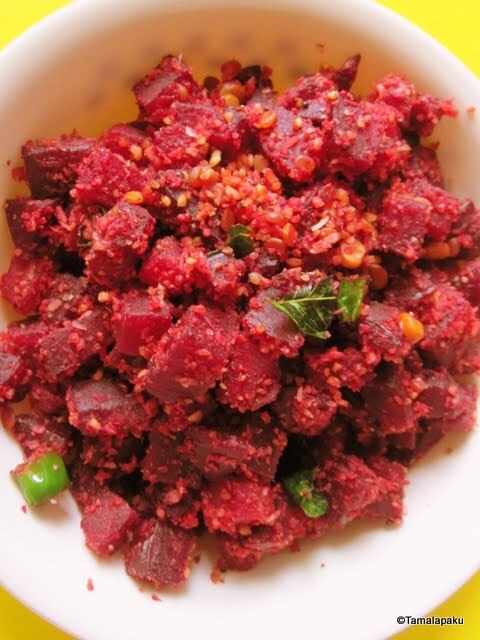 Healthy curry, love it with rice and papads..
Beetroot curry looks delicious and colorful. You truly have prepared a delicious dish. looks so inviting. Great recipe. How long do you cook the beet root in the cooker? @Catherine - Thank you for your interest. I usually pressure cook for about 15 -17 min (start to finish).